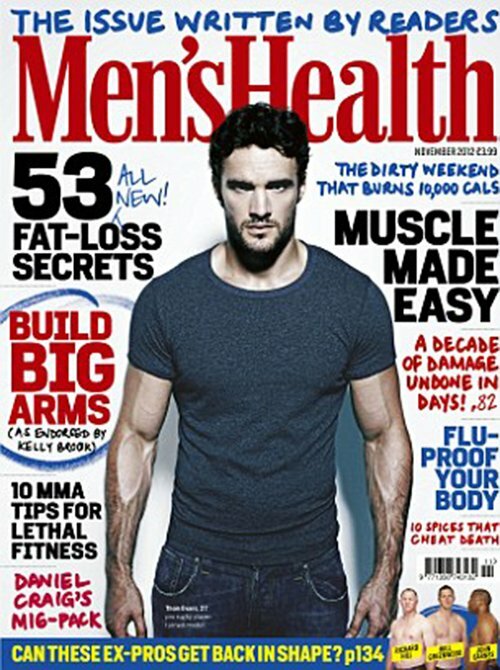 Former Scottish rugby star turned model Thom Evans puts his bulging muscles on display for November 2012 issue of Men's Health magazine. The whole 'be confident in yourself' thing is cheese. Let’s be honest - if a girl is gorgeous, it’s overwhelming. It definitely was when I met Kelly because every guy had posters of her on their walls when I was growing up. If she speaks to you and she’s down to earth, then you’re fine. If she’s not, you’ve saved yourself a lot of hassle. If she’s down to earth and attractive, it’s just a matter of where to sign. For overall definition, stair jumps are hands-down the best thing you can do. What’s more, you don’t have to be an athlete to do them and you don’t need any equipment. Each bound naturally makes you tense almost every muscle you’ve got - your lower body to force you upwards and your upper body to propel you forwards. I did this when I was on holiday for a fortnight and it got me absolutely shredded. Guess Who Is Going Back To School? A Fan Of The Man Of Steel? Can You Bike And Text?